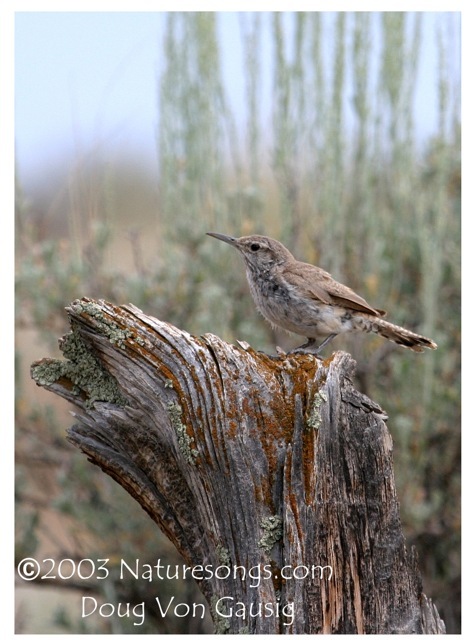 Carolina Wrens (172K, 8.0 sec)(Thryothorus ludovicianus) are common residents of the eastern US. 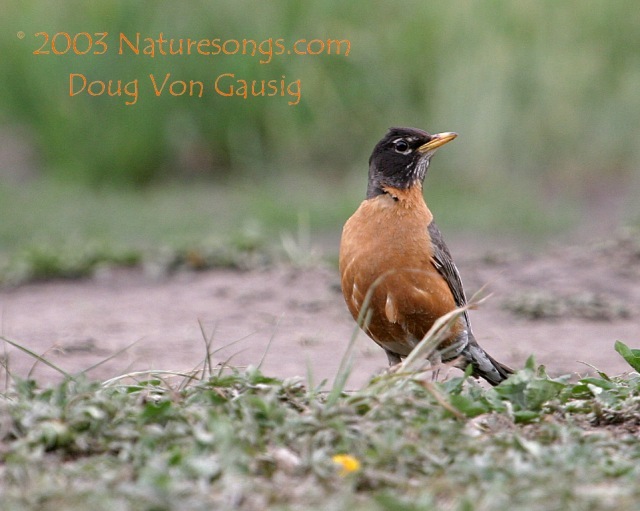 This recording was made as a male sang in the thick brushy creek bottom at Spring Creek Park, Garland, TX, 7/9/00. This wren's song is extremely vatiable in the particulars, but the general style is very consistent. It usually consists of four or so identical three or four-note phrases, sung rapidly and ending on a single note. Here are several examples of the same species recorded within 24 hours of each other and within a few miles, all near Garland and Plano, Texas, 7/9-10/00. 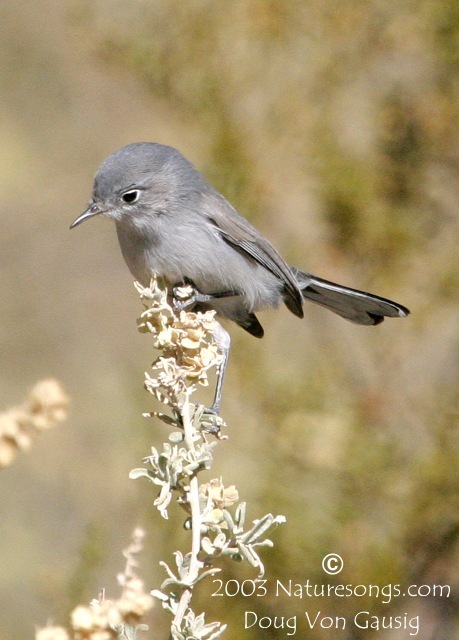 Example 1 (216K, a song/response between two birds) Example 2 (127K) Example 3 (296K, another song/response) Here are some of the common calls (161K) of the species. 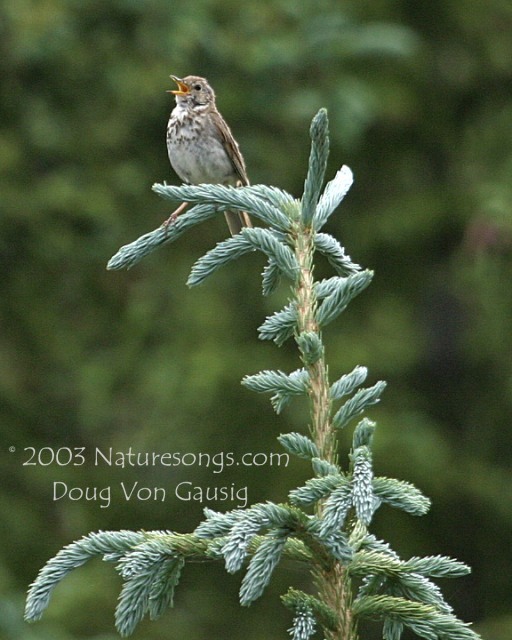 This is a song phrase I find particularly interesting (86K) because I don't recognize it as mimicry of another bird's song, but it is very structured - maybe a mechanical sound he heard somewhere? Let me know what you think! 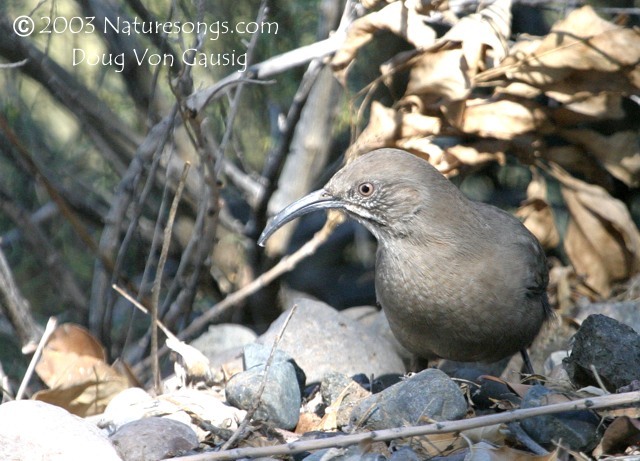 I recorded this Crissal Thrasher mimicing on October 23, 1997 near Peck's Lake. He allowed me to come within 20 feet and record for more than 10 minutes solid! In the course of this tour de force performance, he imitates, very accurately, the following birds in order: Killdeer, Red-tailed Hawk, Western/Cassin's Kingbird, Lesser Goldfinch, Mockingbird, Plain Titmouse, Flicker, House Sparrow, American Robin, American Kestrel (Sparrow Hawk), Abert's Towhee and Song Sparrow. (239K)(MP3 15 sec 46K) This recording was edited to put the recognized species in a row, but I'm posting a "raw" segment (143K, 13 seconds) to demonstrate how he goes from sound to sound very quickly and deftly. This example was downsampled severely to keep the file size down, so please excuse the resulting noise.